Alex Rance has perfectly captured the essence and recent history of the Richmond Football Club in his brilliant first novel, Tiger’s Roar. Tiger was the champion of the jungle. He was strong, bold and proud and he sat on the top of the very tallest tree. But one day the winds blew, the birds shrieked, the tree shook and … Tiger fell all the way down to the mud at the bottom of the tree and bumped his head. This is a clear reference to Richmond’s fall from grace in the 1980s, when they plummeted from the status of fearsome lords of the jungle to the browbeaten, pitiable stray cats kicked around and fed scraps by the rest of the competition. Now we’re back in September after the astonishing triumph of 2017. No premiership hangover for Hardwick and his cohorts. Top of the ladder with eighteen wins and the highest percentage, six consecutive victories before entering the finals and virtually a full list to choose from. The media has been awash with advice from commentators as to how to tame the marauding Tigers. Straight through the corridor, kick short and share it around or wait for Nankervis to get hurt. Dennis Pagan suggests that the Tigers might have gotten ahead of themselves by virtue of finishing on top of the ladder and having too much time to think about premierships. Keep filling those column inches, boys. Maybe we can do it again. Richmond’s raid on the silverware begins with tonight’s qualifying final clash with Hawthorn, a team we have never met in the finals despite 93 years of playing in the same league. Much has been made of the ‘genius’ of Alistair Clarkson in revitalising the Hawks’ fortunes without the need to bottom out and radically rebuild his list. He aims to exploit Nankervis’s lone ranger status by playing two ruckmen in McEvoy and Ceglar despite the forecast of heavy rain. The rain arrives as the match begins. The game is replete with typical finals pressure and fierce intensity. The players are relentless in their attack on the ball. The slippery conditions make clean ball handling difficult, so very few possessions are won in the clear. The Hawks are matching the Tigers in ferocity and giving themselves a real chance. They lead by a point at quarter time. They would have built a more substantial lead but for inexplicable misses from point blank range from Breust in the first term and Burgoyne in the second. The Richmond barrackers vigorously support their heroes, but there is none of the frightening, intimidating rancour they displayed against Geelong in the qualifying final of a year ago. It’s a different experience when you finish on top and are not just desperately hoping for a finals win. Two moments of brilliance ignite the Tigers in the second quarter. Rioli gathers the ball and kicks low along the turf to keep it under Blair Hardwick’s attempted spoil. The ball skids and bobs across the grass and straight over the goal line for a six-pointer. Higgins seized Ceglar’s tap-out in the MCC member’s pocket kick only to see his kick smothered. Edwards knocks the loose ball to Lambert who handballs to a surging Dustin Martin, beating a path alongside the boundary line. Martin evades Howe, turns the ball across his body and finds his target with no space at all visible between the posts. An electrifying moment in Dusty’s quest to savage all comers in the spring campaign. Richmond punch, kick and scramble the ball forward at every opportunity. Hawthorn starts to wilt under the onslaught. Forward half captures, forced turnovers. Too many forward-50 entries, too much time spent in Richmond’s attacking zone for the beleaguered Hawk defenders. Richmond scores eight goals to Hawthorn’s three in the second and third terms. When Higgins lobs his first goal in finals footy at the 25-minute mark of the third the Tigers are up by 31 points and have booked their place in the prelim in a fortnight’s time. Mitchell, O’Meara and Henderson keep fighting and Frawley keeps Coleman Medallist Riewoldt goalless. It doesn’t matter. McIntosh and Rioli boot three apiece. Prestia and Lambert thrive in the heavy traffic and provide sterling support for a best afield Dusty Martin. Rance, Astbury, Grimes and Vlaustin are impassable in defence. My son and I spend almost an hour in the rain at Jolimont Station after the final siren due to the size of the crowd and a number of train cancellations. We don’t mind. The Tigers are on the march again and we reflect on the glorious possibilities. Alex Rance’s book comes to a happy ending. You could hear Tiger’s mighty roar in every part of the jungle. It’s happening. 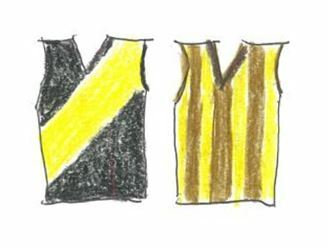 Perhaps there’ll be another flag for Punt Road and a Nobel Prize for Literature for the Tigers’ budding author. Ha ha, next thing you know Luke Darcy will be arguing that Rance should be awarded the Miles Franklin award. Nice, John. A wet September would be nice too. There’s no bigger fan of Alex Rance than me, and I admire his entrepreneurial traits as well as his footy prowess. However, I think it’s worth making the point on a writers’ website that there are many highly talented hard-working children’s authors out there who must wince at the publicity (and royalties) he is able to generate for a book that he allegedly penned in 45 minutes.